If your blog is starting to draw an audience from overseas or you want to collaborate with other schools around the world, you’ll want to find a way to translate your blog into multiple languages. One of the most common questions we receive from our edubloggers is how to implement Google Translate on their blogs. This quick process will help you set up a Google Translate widget on your blog to make it easy for your blog audience to translate your website in a single click. 1. Go to https://translate.google.com/manager/website/add. You’ll be prompted to log in with a Google account. If you don’t have one, you can register for free. 2. Enter the domain of your website (i.e. dleeman.edublogs.org) and select the original language that your blog is written in. 4. Open a new tab in your browser and log into your Edublog. 5. Go to Appearance > Widgets in your dashboard. 6. Drag a text widget to your sidebar or widget area. 7. Copy the embed code from Google and paste it into your text widget. 9. Reload your blog. You should now see the Google Translate widget in your sidebar. 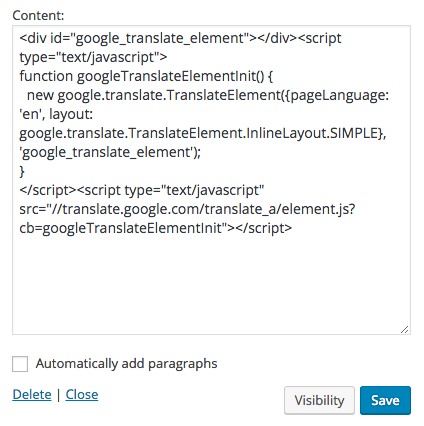 Now your visitors can click on their own language to translate your blog! Thanks for sharing the precious knowledge to translate the information. Worthy to read and all the information given in pictorial view due to that easy to understand. It’s not working on my EduBlog (Wix) site. When I paste in the text and click “save”, the bottom line of code disappears. Some part of my blog is not written in English and Google Translate does not have English Language. How to add English to the language options? Google no longer gives a meta tag so these directions do not work. Is there a different way to add translate? Hi Sue, thanks for letting us know. We’re writing an updated post with the new instructions and it should be published this week. You no longer need to add the meta tag. You follow the same instructions but just copy/paste the code they provide into a text widget in your sidebar. Thank you for the clear and thorough post. I’ve had a lot of luck using http://babelblogs.com/ with machine translation and I’ve going to try their integrated human translation which would be even better. Anyone else using this? Hi – Is the Google translation widget free to use or is there a cost associated with it? I have read contradicting information regarding this (i.e. charged for every million characters). Great Work. It’s really Helpful. Keep It up! Great tutorial! It helped me a lot! I managed to put this widget on my blog just fine. is there any way to change title in google script select language into choose language ??????? I must agree that Google Translator is very popular among us teens these days. Although it’s not 100% accurate, it does help a lot. This is a great way for most of us second language learners to understand the language easier. That is a quick and easy trick so I’ve heard. Why won’t it work on the account that I have? Embedding media in posts and widgets is a feature of Edublogs Pro. I followed every direction to the letter, but for some reason, every time I press “save”, half of the text I pasted in disappears. I have tried reloading the page several times and even regenerating the code, but nothing works. When I refresh my blog in a seperate window, only the leftover text is displayed, no translate box. Please help! I have many students whose parents do not speak English, and I think this tool would help me to communicate better with them. Thanks so much! Please provide a link to the blog you are trying to add the widget to. We need to check your blog to see what is happening. I have one question. Google says that automated translations need to be blocked from the search engine crawlers through the “noindex” function as they are a violation of search engine guidelines. I apologize that I cannot provide a more in-depth answer, but I wonder if automated translation (per the help forum) refers to automatically sending users to a translated version of the blog versus the user self-selecting to translate via the translate widget on the blog. If you had set up your website in such a way that sent users from certain countries to automatically translated pages, then you would want this to be noindexed so that it would not create duplicate content. I attempted to add this and was unsuccessful. I tried to refresh my code page on the google translate page and can no longer find it. May you please help me with this? Hi. If you could, send an email top [email protected] with your blog URL and these details. We’ll take a look and see what we can do to help. Hi! I love google translate! I thank you!